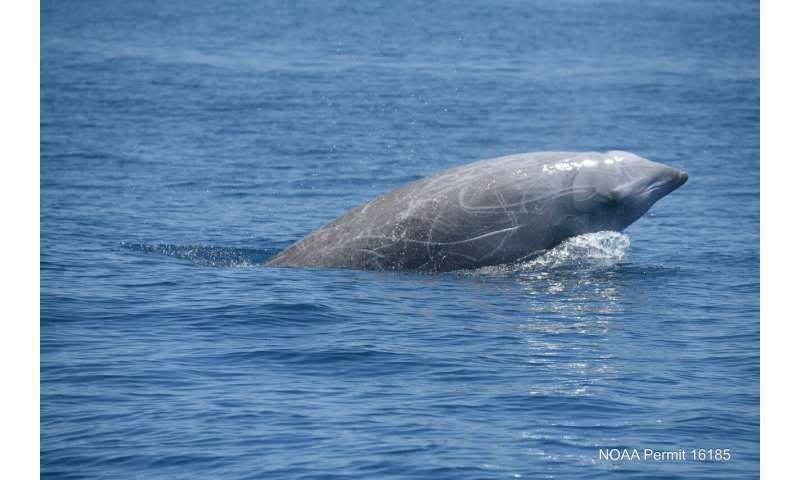 A new Duke University-led study provides the first detailed record of the diving behavior of Cuvier's beaked whales in U.S. Atlantic waters. "Their deep dives average about 1,400 meters, lasting about an hour, while they are feeding near the sea floor. They typically only spend about two minutes at the surface between dives," said Jeanne Shearer, a doctoral student in ecology at Duke University's Nicholas School of the Environment. "It's amazing that they can dive to such depths, withstand the pressure, and be down there that long, with such brief recovery times." Past studies have documented the diving behavior of Cuvier's beaked whales in Pacific waters, Italy, and the Bahamas, but this is the first one focused in the U.S. Atlantic. Scientists estimate about 6,500 Cuvier's beaked whales live in the northwest Atlantic. Populations in different areas exhibit some differences in diving behavior, highlighting the need for data from around the world. To conduct the study, scientists attached LIMPET satellite-linked tags to 11 Cuvier's beaked whales that live and dive most of the year in waters a two-hour boat ride from Cape Hatteras. One tag failed, but the other 10 recorded 3,242 hours of behavioral data from 5,926 individual dives—both deep and shallow—between 2014 and 2016. "Cuvier's beaked whales are only half the size of the sperm whale," Shearer said. "Their dives push the limits of mammalian physiology, but we still don't know how they're able to behave this way." Aside from adding to our knowledge of the species' remarkable diving capability, the findings provide a baseline for controlled experiments, now underway at Duke, to study their reactions to low levels of sonar. "It's important to understand their typical diving behavior in order to interpret the results of behavioral response studies," said Shearer, who conducts her research at the Duke University Marine Laboratory in Beaufort, N.C.
"These animals are fascinating and there is so much we still don't know about their behavior and physiology," Shearer said. "They are the world's deepest mammalian divers, but we don't yet understand how they dive to such extremes."